Rookie article writer sharing the wonders of Brisbane with Australia & the World! 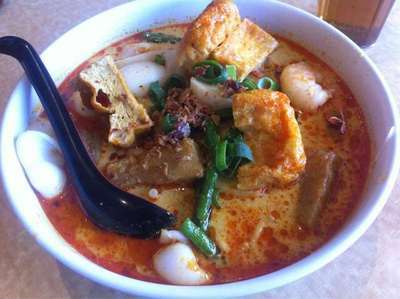 It is slowly becoming a well known fact that some of the best Asian cuisine can be found in Market Square, Sunnybank. Amongst the amazing array of quality restaurants one stands out in particular, Malaya Corner. This restaurant is already very popular with the locals and word is slowly spreading across Brisbane thanks to some very happy customers. Not only is the food incredibly delicious every time but the price, quality, quantity and service are just as outstanding. Malaya Corner offers an enormous range of delectable Asian meals from warm curries and laksas (great for winter), to a classic noodle stir fry. The generous servings will fill any hungry stomach, and guaranteed you will be asking for a take-home container. Most dishes are also $15 or less, so you'll also be taking home more change. Not only do they do great food, they also create some exquisite beverages. Some household favourites include Milo Frappe, Iced Ribena & Lemon and the Hong Kong White Tea. Don't be afraid to let your taste buds explore some new flavours as they are guaranteed to be impressed. Most importantly the service at Malaya Corner is well up to standard which can be hard to find in Asian restaurants due to the language barrier. There are always plenty of staff on the floor who promptly attend to you on arrival and continue to provide excellent service to create a wonderful dining experience. So next time you are craving something with a bit of an Oriental flavour, I strongly urge you to try Malaya Corner in Market Square, Sunnybank. Why? This restaurant is already very popular with the locals and word is slowly spreading across Brisbane thanks to some very happy customers. Great article, and it is good to hear about places that have interesting drinks as well as interesting food... A milo frappe sounds pretty good to me. I went to Malaya Corner for the first time recently and was blown away by the food. Even though it's a long drive across town I can't wait to go back.